•Motivate yourself or a friend to get active and join us. 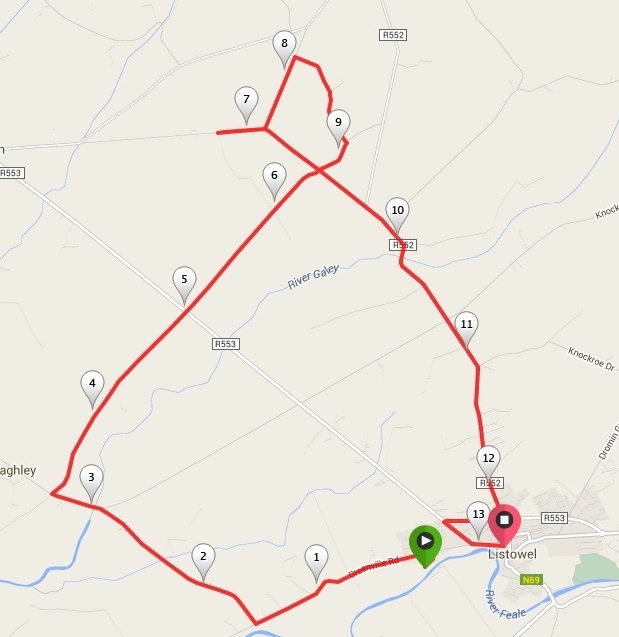 If you’re not one of the crazies running around the park 63 times in preparation for the Sixmilebridge event, we have two routes for this Saturday. The shorter is the “old dependable”, Dromin, which is around five miles. More details here. 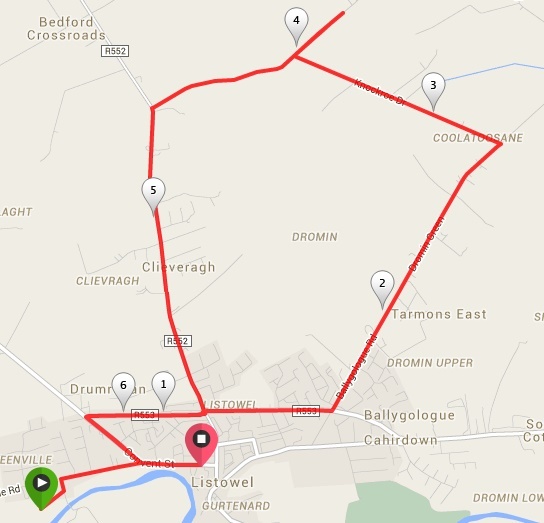 For those who want to go a little further (especially if you’re planning to do the Clonakilty half marathon on 7th December) there’s a longer, eight mile version. This starts and finishes along the same route but, instead of turning left at the top of Dromin and running along the dog walk, takes the second left turn all the way down to the Clounmacon road, then left at the bottom all the way along to Bedford Cross and back into town. More details here. Meet at 8am in the car park for the off. See you there. Our post-Dublin Marathon awards night will take place on Saturday 2nd November from 9.30pm in Tankers Bar. It’s a bit of fun and an opportunity to meet up after the marathon and swap epic stories about cramps and side stitches. Saturday 19th October : 9:30am. 10km Communal jog on Ballybunion Beach followed by cold dip in the sea (brilliant to re vitalise muscles and any aches or niggles you might have) This morning is going to be a fun morning! We want people to come out and run as a group. No fast sprints as we want no injuries. We can all be safe on the beach and head up to the Cashen. We will all wait for everybody at the top and head back together too. Friday 25th October : 12:30pm TBC Nano Nagle School. Meet and greet with the kids and presentation of funding cheque. Please bring your shirts for a picture. Saturday 26th October : 10am Tankers Bar. Pre-marathon Breakfast and Motivational Morning followed by Q&A. Well worth attending this for bonding and morale. Please do your best to make it as its all part of the build up. 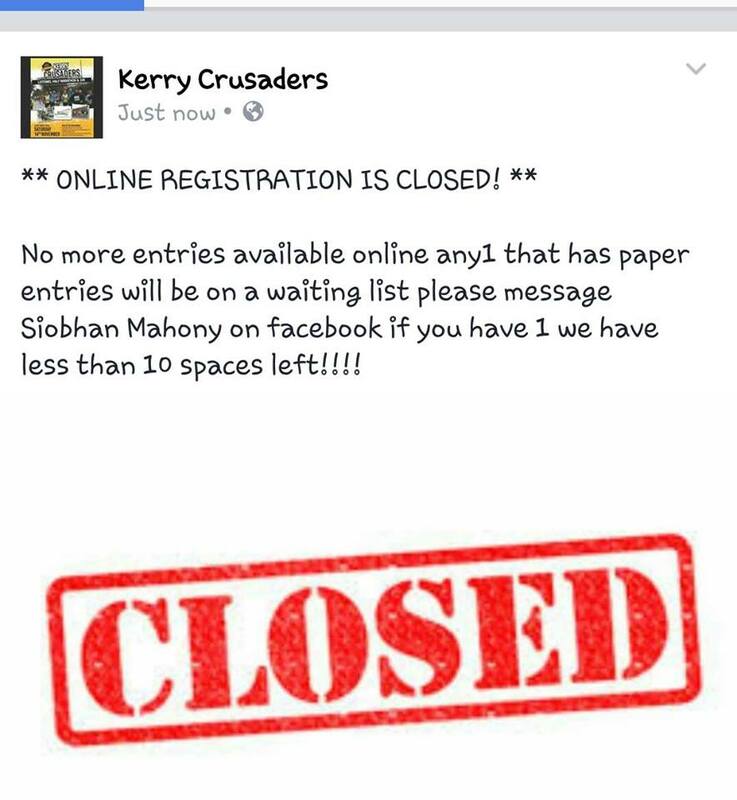 Saturday or Sunday 26th and 27th : Registration at the RDS Simmonscourt. Open from 9am to 6pm both days. Sunday night : Get back to your hotel and get settled. Get a light bite to eat. try to relax and let the night pass. Get your gear ready for the morning early. Have it laid out and ready to go. Monday Morning 29th: RUN DAY! 5:45am : Alarm bells set to go. Get up and get moving. Light breakfast will be available in the restaurant. Post Marathon : Drinks in O’Donohues pub just off Merrion Square. Saturday 2nd November : Awards night and post Dublin party in Tankers Bar. 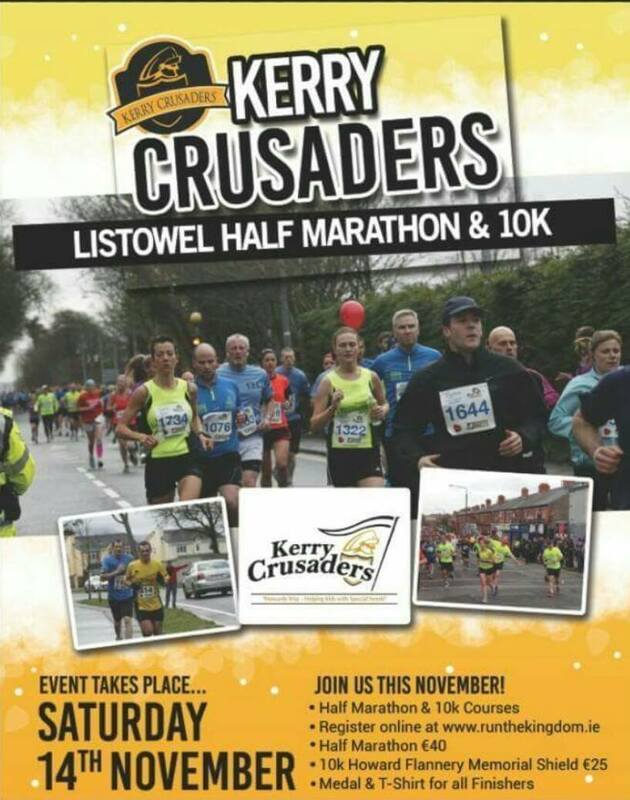 Friday 22nd November : Kerry Crusaders Social in the Listowel Arms Hotel. • Plastic bag for dirty clothes, etc. On the morning get up fine and early and make sure you get to the toilet! Have 2 bottles of water and keep sipping them all morning right up to the race. SIP! do not gulp! If your carrying Nurofen try to hold off taking them until after mile 15. UPDATE: Jeremy has a bag of reflective / hi-viz tops from the Road Safety Authority. If you want one, ask. Now that the mornings and evenings are darker you need to consider how visible you are to other road users, particularly motorists. If you are starting the long weekend runs at 6.30am you are running on unlit roads which makes it even harder for drivers to spot you. Although our running tops are bright yellow, they are not fluorescent and won’t catch a cars lights. Please consider wearing a reflective vest or jacket and we recommend buying a set of lighted armbands from Aldi or Lidl. They cost €5 for four armbands so if you split the cost between four of you it will only set you back €1.25 each. Both supermarkets have them in stock at the time of writing so get them while they still have them. We have reserved fifty rooms at the Ballsbridge Hotel, Pembroke Road, Ballsbridge, Dublin 4 for this year’s event. The Ballsbridge is just up the road from the RDS, where the marathon expo is and where you have to pick up your race number the day before the marathon. Its a 20 minute walk to the start line on the morning of the race and we all walk up together for the pre-race briefing at Buswell’s Hotel. Rooms are being held until 27th September so if anyone wants to book a room you must do so in the next four weeks. Contact the hotel directly on 01 6379300 or by email: reservations@ballsbridgehotel.com and quote “Kerry Crusaders”.